This magnificent 3 bed/3 bath, 1,600 sq. ft condo is located on the fourth floor next to the beautiful Sandy Ridge community pool and splash park. The master bedroom has a King bed, a HD TV, a large walk-in closet, and a large en-suite bathroom with dual sinks, bath tub and a large walk-in separate shower. Sandy Ridge Drive is conveniently located on the Independence golf course by Tom Watson for the enjoyment of the golfers in your party. Complimentary high-speed wireless internet access is also available throughout the condo as well as complimentary local and long-distance calling in the United States. All of this can be found in the exclusive Reunion Resort, a truly beautiful place with the ultimate in amenities including infinity pools, fine restaurants, a full-service spa, scenic walking trails, fitness center, kid’s activities and much more. Step into luxury in this three-bedroom condominium. The spacious living room and dining area have been furnished to an extremely high standard to ensure the ultimate in comfort during your vacation. With a flat-screen HD cable TV, PlayStation 4 and ample seating, you can relax as a family after a long day at the parks. Beautiful sliding patio doors lead out to your own terrace balcony where you can enjoy the beauty of central Florida. There is also a fully functional kitchen equipped with the latest appliances to make cooking a breeze. The separate dining area has a elegant dining table with seating for 6. The second bedroom features a Queen bed, a HD TV, a large closet and a private en-suite bathroom featuring dual sinks. The third bedroom has 2 luxury Full beds, a HD TV, a large closet and an en-suite bathroom. This condo is just 1.5 miles away from the main pool in the resort located at Seven Eagles. The Seven Eagles Pool is the most popular within the resort and boasts two relaxing Jacuzzis with plenty of pool side seating. Enjoy pool side refreshments and dining at the Cove Bar and Grill, with a menu of sandwiches, salads, snacks, and smoothies, as well as a full bar. 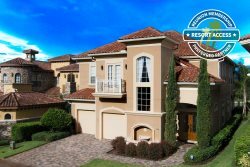 Only if you wish to access an additional 5 of Reunion’s Pools including the Water Park and the Tennis or Golf will you need to be registered as a House Guest. There is a limit to the number of days that can be appointed to house guests. Therefore the house guest registration is not for the entire length of your stay, just the specific date(s) you wish to access the Water park, Tennis or Golf. There is a registration fee which is for one day. This is for you and all of your party - NOT EACH. If available, additional dates can be purchased. You are required to be registered for your desired date(s) at least 5 business days before your arrival. Once registered, your dates cannot be changed, the passes cannot be credited or reissued even if the water park is closed for any reason or if they are not collected or used. Once you are registered you and all of your party will be able to access 5 additional pools [reunion house guest] including the Water Park, Golf, and Tennis. Each of these activities requires and additional fee, the Water Park is $18 per Adult and $12 per Child payable at the entrance, Golf is $120 per person during low season (Jun to Dec) and $180 per person during Peak season (Jan - May) and Tennis is $20 for one day.